Today was a significant day for the disability community. 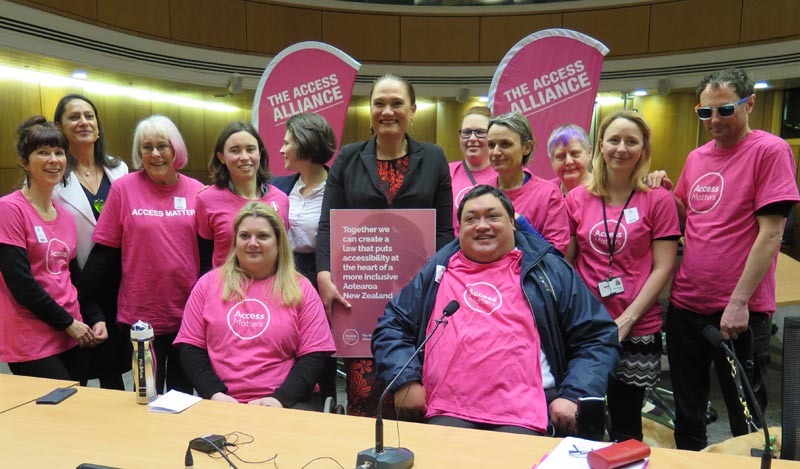 For over a year now, the Access Matters campaign, led by a group of twelve disability organisations called the Access Alliance, have been calling for accessibility legislation at the heart of a more inclusive Aotearoa. I am just one of many disabled people who have been sharing stories about the access barriers we face in trying to get around, access buildings or housing, work, or participate in our communities. Though our stories are diverse, there is something we have in common. 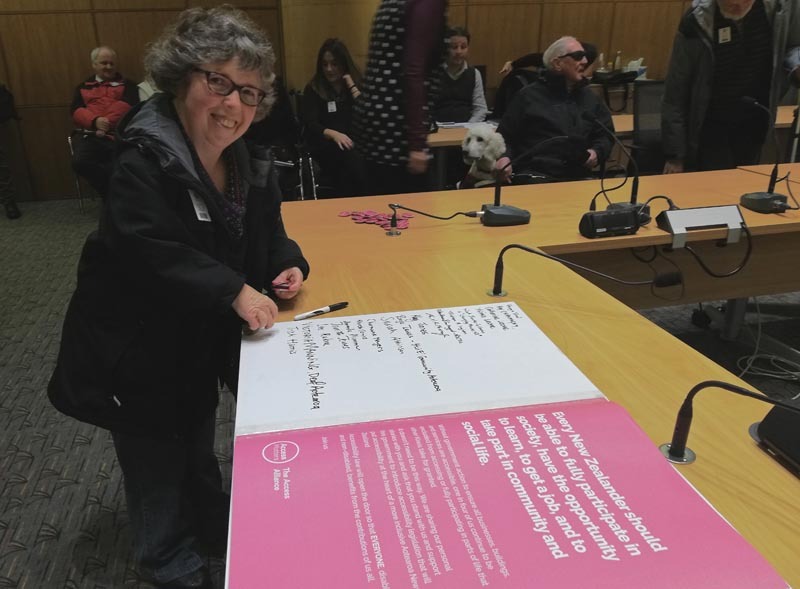 Together, we are campaigning for an Accessibility Act that makes accessibility a priority, and sets out minimum accessibility standards could help remove all of these unnecessary barriers. The stories of the many barriers we face are the reason I went to Parliament today. At a public presentation, I had the honour of delivering a booklet full of them to Minister for Disability Issues Hon. Carmel Sepuloni. 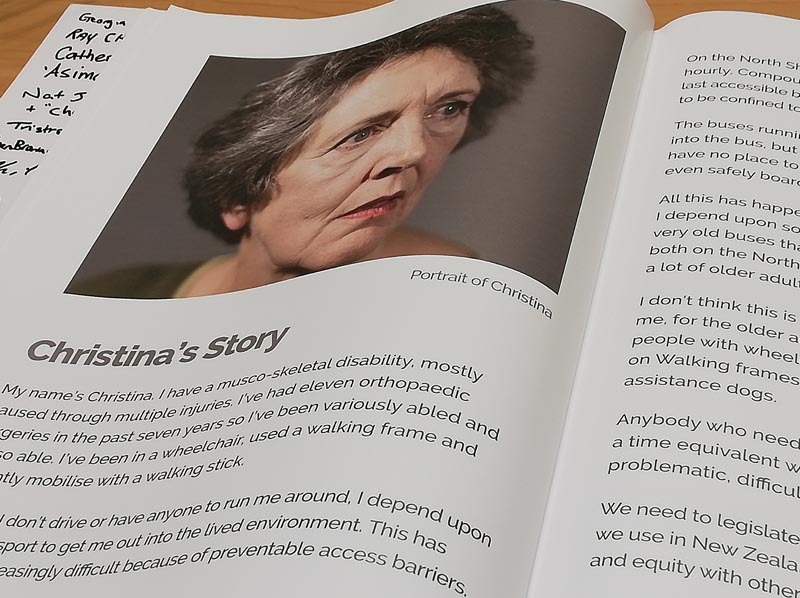 The booklet is teeming with stories of people facing different but connected barriers. There’s Aine’s story. Aine is blind. After receiving a job offer, she was disappointed that the electronic job acceptance paperwork sent by the employer were not accessible with her screen reader. Approaching the organisation and requesting accessible forms, the organisation said they couldn’t provide these because they were government-issued forms. Aine was ready to give her skills and talents to an organisation but faced barriers to employment. There's Natasha's story. Natasha and her husband are Deaf. One day, in the middle of a train trip, they saw everyone getting off the train and they couldn't work out why. The conductor came over to them and started telling them off but she spoke too fast for them to follow what she was saying. 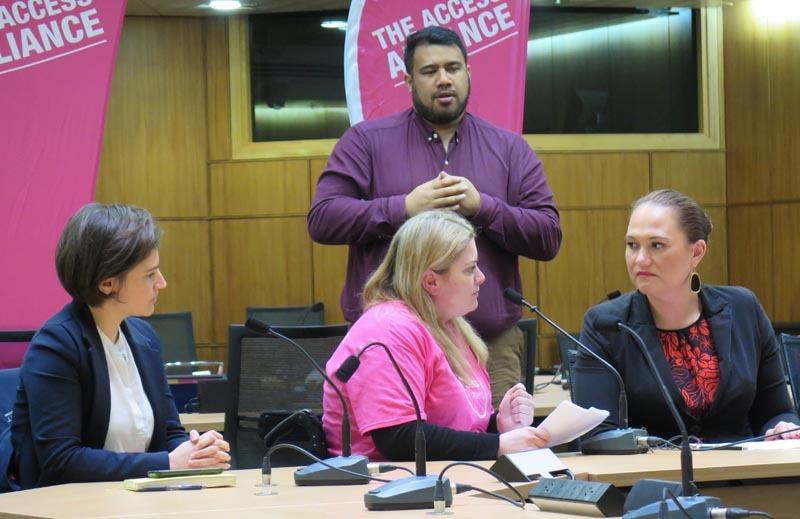 Accessibility law could ensure that all drivers are required to do disability awareness training to ensure they know how to communicate appropriately so all passengers can access important information. Then there’s my story. I am a wheelchair user. I enjoyed catching the ferry to work, until one day the organisation called me to say that the ferries were not accessible for people using wheelchairs, and that I should find a different way of getting to work. I can’t change my disability, but organisations and governments can design their services in a way that ensures myself and the many others out there who also use wheelchairs are able to do simple everyday things, like get to work. There are many more. The stories in the booklet are just one sample of countless other barriers people living with disabilities face on a day-to-day basis. Our stories are powerful, both in their diversity and their representation of our collective experience. Like a woven kete, each person’s story brings a unique strand to this campaign and to our movement. And yet, there is an underpinning narrative, a shared experience which has woven us together, which gave us the strength to stand here today, at Parliament. These stories, this kete, hold some important messages, messages we would like our decision makers and the country to hear. 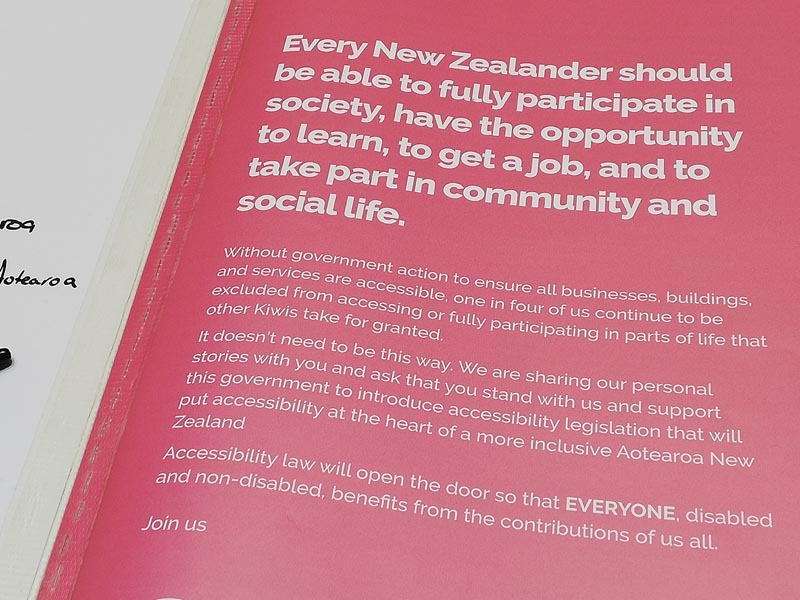 The first message is that we as New Zealanders value inclusion and working together. We pride ourselves on being the first country in the world to give women the vote and on rallying around our communities in times of need such as in the wake of the Canterbury earthquakes. And yet, today, one in four of us living with disabilities face unnecessary barriers on a daily basis doing things many take for granted. For many of us, getting or working in a job, learning, getting around our town or city, and taking part in our community is a daily challenge because our society is not set up as well as it could be to be accessible and inclusive for everyone. Our stories also carry a message that these barriers are not individual but systemic. It’s not our disabilities which hold us back: it’s society and the way it is designed. Our stories are not one-offs and they are not the exception despite all too often being portrayed this way. They are common experiences, shared by hundreds and thousands of us around the country, every day. We are tired of individual battles. We want change on a larger systemic scale. Participation should not be an individual battle. Participation is a human right. The next message we have is that this is an issue affecting us all. When we consider that one in four of us live with a disability, we are potentially excluding 25% of the country from different areas of everyday life. This inevitably has wide-reaching social and economic impacts. Click-Away Pound is a research survey designed to explore the online shopping experience of people with disabilities and examine the cost to business of ignoring disabled shoppers. The survey found that failing to provide customers with accessible websites cost UK retailers £11.75 billion in 2015. People with disabilities have capital, talents and skills to bring to workplaces, educational institutions and businesses. Getting accessibility right means we can harness those skills and talents. Getting accessibility right benefits everyone. The last and perhaps most important message we carry moving forward with this campaign is that it doesn’t have to be this way. The barriers we face today don’t have to exist tomorrow. There are solutions to the barriers in all of our stories. Both the Government and the organisation that Aine was applying for a job with could have ensured their application forms were compatible with screen readers. There could have been a visual notification system in place to ensure Deaf people are made aware of important transport information and changes. In my case, the organisation could have taken steps to make the ferry accessible for me and everyone else who uses wheelchairs. They could have but they didn’t because right now accessibility is not a priority. An accessibility law will make it a priority. It’s what we need to set clear standards, timeframes, and guidelines so that organisations and governments will take action to remove barriers to accessibility. Change is possible, and it can happen now. Join us tomorrow, help us make this change a reality. Juliana Carvalho is an Access Matters campaigner who presented the booklet of 17 stories to Minister Sepuloni. This story was first published on the Scoop website. Original generation time 1.2946 seconds. Cache Loaded in: 0.0005 seconds.